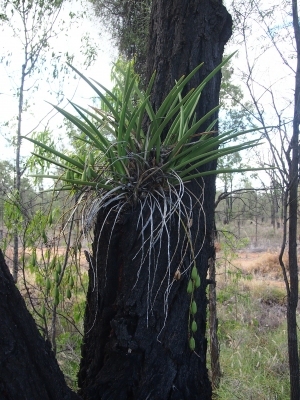 Plant in flower and also bearing seed pods from the previous years flowering. Cymbidium canaliculatum is an epiphytic, evergreen, perennial orchid that can grow about 50cm tall. The edible swollen stem is sometimes gathered from the wild for local use. Australia - Western Australia, Northern Territory, Queensland, New South Wales. ]. It grows on rotting wood in the hollows of trees in dry sclerophyll forest or woodland. A plant of tropical and subtropical areas. Grows in the wild on rotting wood in the hollows of trees in dry sclerophyll forest or woodland.